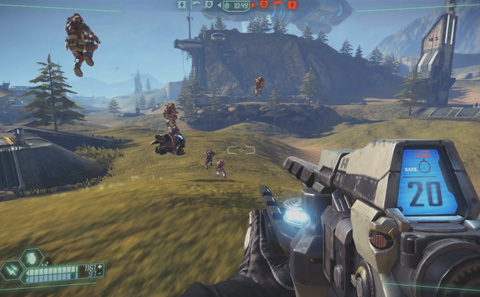 Tribes: Ascend has gone Free2Play a little over a week ago. I was in closed Beta, but could not write about it or my impressions because of an NDA. Still within close beta, Hi-Rez studios released a big patch, changing a lot of things; even as far as basic game decisions like how many and which classes they provide; they were reduced a lot in numbers. The changes were great. While I did not have that much fun before, I was finally really enjoying the game. And better yet, a week later (which is now a week ago) the closed Beta became an open one. Although there are still some (smaller) issues, the game is still in Beta, and I feel like it is a lot more polished already than most AAA titles already. While Battlefield 3 did an Open Beta for PR at best (even the worst UI issues still exist now, months after release), Hi-Rez studios listened to the feedback and re-modeled the whole game and its gameplay and selling aspects. The game itself is from the long-going Tribes series, which did not see new games for a little while. However, Tribes 2, which was released in 2001, is still played today. GamePlay is fast-paced but not hectic. Rather fast at top speed than focused solely on fast reactions. Projectiles is a big part as well. Maps are big, and you ski (slide on ground) and have a jetpack. Combining these, you can use hills for more momentum and higher jumps. When everyone is scooting and flying, and you have projectile weapons; you will have to shoot planned/intuitively with momentum in mind. This makes for a very interesting gameplay mechanic. Mix this with the typical Tribes game mode: Capture the Flag, and you get something very neat. Amongst the classic CTF, Tribes: Ascend also features Team Deathmatch and Arena. Arena was added just recently and is a Team Deathmatch on smaller arenas above death-ground (rather floating islands, above lava for example – use your jetpack energy wise 🙂 ); making for some intense and more focused battles than in “normal” TDM. When you begin, you have 3 unlocked classes; a light fast one, a medium “Soldier” one, and a heavy one with the big guns, a ton of HP, but a lot slower ofc. The Free2Play model they target seems to work well. You get XP from matches, which you can use to unlock. You gain XP at a rate, which seems fair to me (looking at the XP gain relative to the XP required for unlocks). Apart from the in-game XP you can buy Gold Coins which you can use to unlock as well, or get some boosters for more XP gain in-game for a limited time. Although not a full game, I could unlock quite a bit for 15 € (which converted to 20 USD, which converted to 1800 gold coins). Also, buying gold coins once will make you a VIP, resulting in double the XP from games. So yeah. You! Try it out!